Is anyone else over the hunt for good snacks for your kids? I know I am. My kids snack a lot, so I really feel the need to make sure the snacks I’m giving them are healthy and tasty. But does healthy and tasty exist for kids? I remember this one time I tried to give Jake quinoa crackers, and he spit them out of his mouth. I tried them, and I have to say, I get it! They were disgusting. Is there a rule that if something is super healthy it also has to taste bad? The allergy-issue has also been prominent in my hunt for good snacks. Sophie has some friends with severe allergies to foods like nuts, dairy, and gluten. When these friends come over, or Sophie wants to share with them at school, I have to make sure the food she gives them is allergy-friendly. This makes it that much harder to find healthy snacks. I have found a select few of these allergy-friendly, kid-approved, healthy snacks, which is awesome, but they just tend to be outrageously expensive. I am glad to say though, the hunt is over, because I finally found a great snack that I can justify spending the money on! 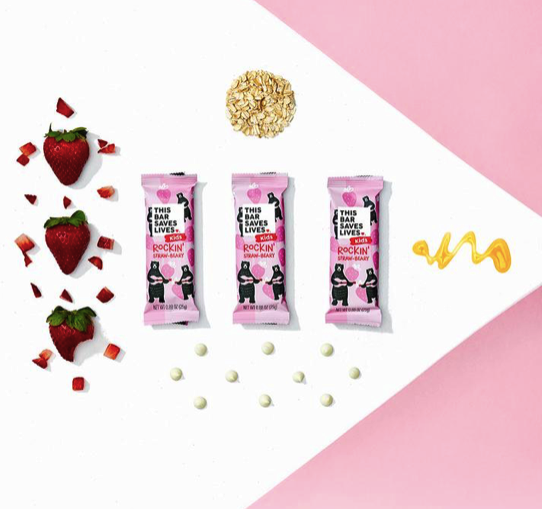 It’s a kids bar that is loaded with nutrition, tastes great, and saves lives – literally. It’s called, “This Saves Lives” and every time you make a purchase, a life-saving food packet is sent to a child in need. I was absolutely amazed by this product. My kids love the taste, and the bars are free of the top eight allergens! I have peace of mind knowing that they’re healthy, with only five grams of sugar, and they help children in need. It’s also loaded with nutrition from oats and even fruits and veggies. There’s seriously no losing with this snack. It’s been a while since I could say that about a snack for my kids- ha! Moms, I highly recommend this bar for your kids.